One hundred years ago, the mightiest "unsinkable" ship began her maiden voyage to cross the Atlantic. An engineering feat eleven stories high, the Titanic contained a list of passengers collectively worth $250 million when she left port on April 10, 1912, but she would never reach her destination. The Titanic collided with an iceberg on the night of April 14, and 1500 people died in the freezing waters as the ship met her watery grave. Spectacular in many ways, it's a story that has spurred legends and still sends shivers down the spine a century later. This minute-by-minute account of the sinking is based on over 20 years of research, and offers amazing detail of that fateful night. Read by Martin Jarvis, it's a riveting account of one of the world's biggest maritime disasters and the behavior of the passengers and crew. Some sacrificed their lives, while others fought like animals for their own survival. Wives beseeched husbands to join them in lifeboats; gentlemen went taut-lipped to their deaths in full evening dress; and hundreds of steerage passengers, trapped below decks, sought help in vain. 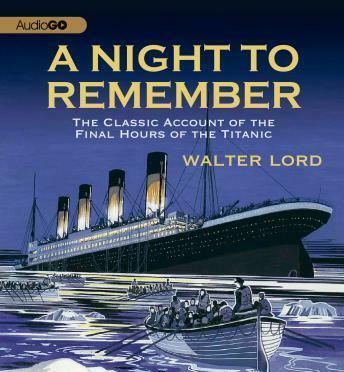 From the initial distress flares to the struggles of those left adrift for hours in freezing waters, this audiobook brings that moonlit night in 1912 to life for a new generation of listeners. Before I used this app the book was recalling boring but once I started using this it was kind of fun and interesting to read. Not that bad of a book so far.